The Klamathon Fire, which started near the tiny town of Hornbrook (Siskiyou County), has forced evacuations, damaged or destroyed at least 12 structures, and by Friday afternoon it had ravaged more than 8,000 acres and was only about 5 percent contained, according to local officials and the California Department of Forestry and Fire Protection, or Cal Fire. Officials have yet to officially identify what started the blaze, but they have a good idea of where it started. The dispatch records indicate the fire ignited a tree, jumped the river by early afternoon and rapidly grew as it took off into grassy hills studded with trees. 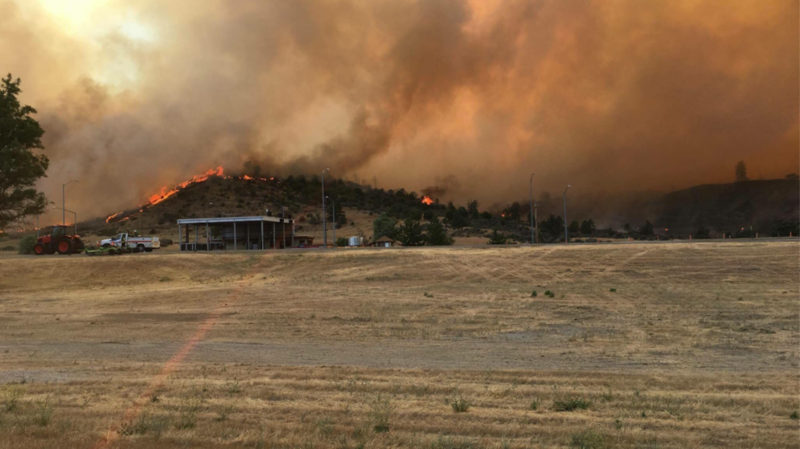 An evacuation order was still in effect Friday for Klamathon Road, from Interstate 5 to Ager Road, as well as for residents of Hornbrook and the communities of Hilt in California and Colestin Valley in Oregon, according to Cal Fire. Nancy Hood, 36, a resident of Yreka — a city of 7,600 people just 19 miles south of Hornbrook — said she was concerned about her friends and neighbors. Meanwhile, the massive fire burning in Yolo and Napa counties continued to challenge firefighters from across the state as they struggled to contain the northernmost part of the blaze, which on Friday entered its seventh day and had burned nine structures. In Alpine (San Diego County), the West Fire on Friday ripped through the area near Cleveland National Forest to burn more than 350 acres. Other fires in the state to reach triple digits Friday in burned acreage included the Box Fire just north of San Bernardino and the Irish Fire in Amador County near Sacramento, both of which had at least 100 acres go up in flames.